Grip and handle bulky material with the powerful bite of the 3-tine grapple attachment for compact excavators. The three-tine design lifts and moves large and even hard-to-manage materials with ease. Move brush, logs, and landscaping stones on jobsites requiring work such as land clearing, landscaping, demolition, construction, and buildings and grounds maintenance. Bite down and get a grip with the 3-tine grapple. Use alone as a rake or combine with a hydraulic clamp for increased versatility. 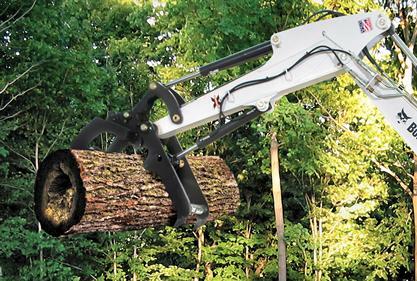 X-Change™ Attachment Mounting System: Makes easy work of attaching and detaching the grapple. Fast and easy mounting means spending less time on attachment changes and more time on the job.